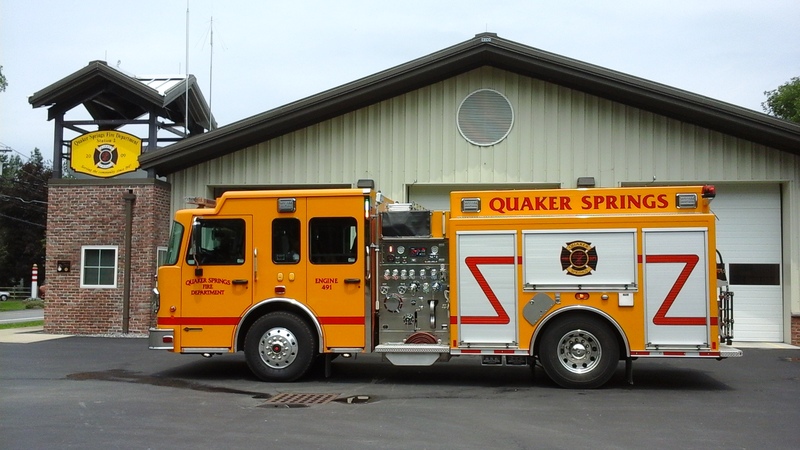 Quaker Springs Fire Department is proud of our fleet of firefighting and rescue equipment. We have 2 primary attack trucks responding from each of our fire stations. 493 and 497 are housed in Station 1 on Blodgett Rd. 491 and 492 are housed in Station 2 on Route 9P. 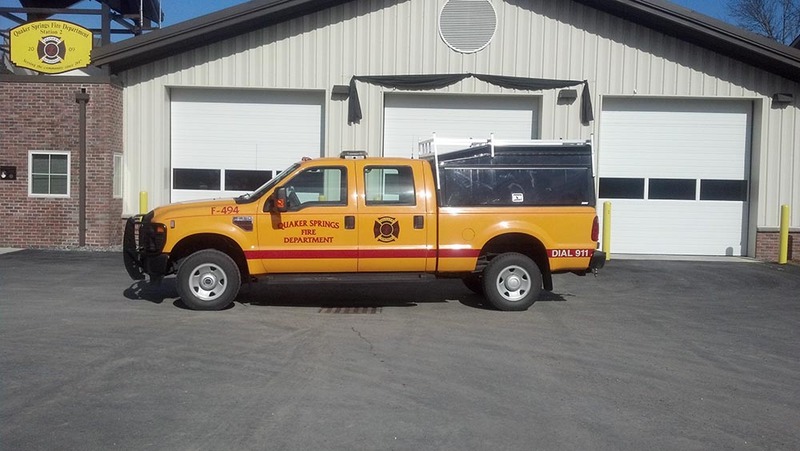 Our fleet is well maintained and equipped with state-of-the-art firefighting and support equipment. In April of 2015 QSFD took delivery of E 491. E 491 has a Spartan Metro Star Chassis with seating for 6 firefighters. The truck carries 750 gallons of water with a 1250 gpm pump. The truck is equipped with a 6kw hydraulic generator, 4 gas meter, Cutters Edge saw, Genesis extrication tools and an AED. ETA-492 is a 1992 Central/International built by WildeFire in Mayfield, NY. The main purpose of ETA-492 is for tanker shuttles and water supply. The truck is equipped to run as a pumper if another truck is out of service or there are multiple calls. On Saturday, March 29, 2008, QSFD took delivery of ER-493. 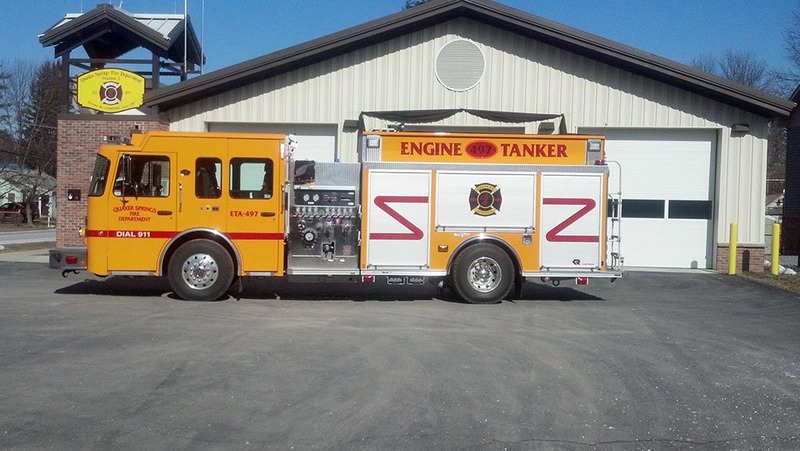 ER-493 has a 2007 Spartan Advantage Chassis with a 6-man cab. The truck carries 1000 gallons of water and has a Darley pump that can move 1250 gallons of water per minute. ER-493 is equipped with a 9 kilowatt hydraulic generator and carries a Genesis Jaws-of-Life, 1000 feet of 5" hose, 500 feet of 3" hose, a CO meter, ice rescue equipment, a thermal imaging camera, farm rescue equipment , a positive pressure ventilation fan, an AED, and a landing zone radio and GPS. All the equipment on ER-493 was purchased by the Fire Department through grants and donations. Thank you for your support! F-494 is a Ford F350 crew cab with a 6.0l diesel engine. It was put in service in 2007. The truck carries ice rescue equipiment, a back board and brush fire hand tools. F-494 is used to tow MR-498. 494 was purchased by the Fire Department through grants and donations. Thank you for your support! F-495 is QSFD's brush truck. The truck is a 2004 F-550 4X4 w/ 6.0 liter turbo diesel engine with a a skid package including a 300 gallons of water and a 18 hp High pressure pump. The truck has a hose reel with 250' of 3/4" reel-tex hose and can connect up to 3 more 1" forestry lines. The truck is equipped with various brooms, chainsaws, shovels and rakes as well as 6 soft Indian tanks that can be filled off the pump. The vehicle has a brush guard and 9000 pound winch that can be used on the front or back hitch. 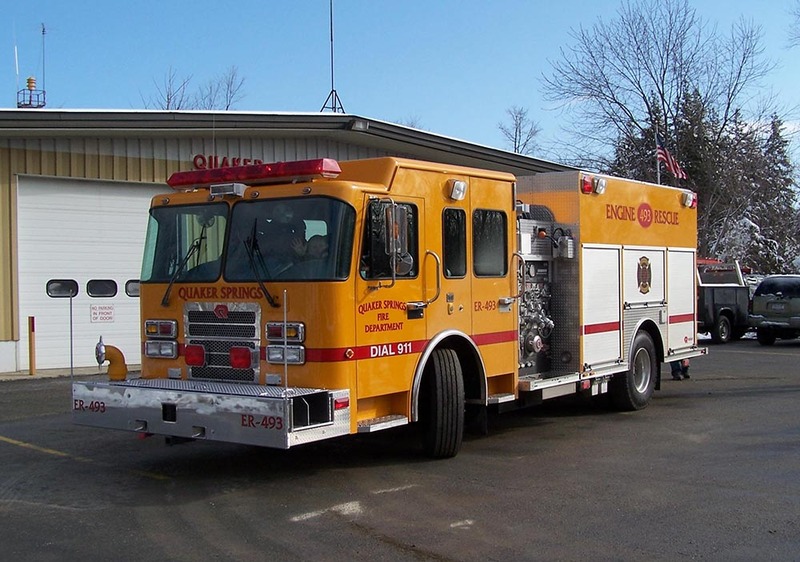 In June 2011, QSFD took delivery of ETA-497. ETA-497 has a Spartan MetroStar chassis and the Rosenbauer Centurion stainless steel body. The truck carries 1,250 gallons of water with quick dump, a Darley 1250gpm pump and a 6kw hydraulic generator. Other equipment includes a thermo-imaging camera, a helo landing zone radio, portable pump, AED, and K-12 saw. MR-498 is QSFD's rescue boat. 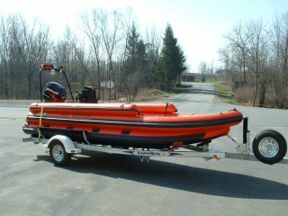 The boat is a 2004 Zumro Rescue Boat w/ 60 hp Mercury 4 stroke engine and 13" big foot prop. The front of the bow opens up for easy recovery of victims, rescuers and divers. MR-498's equipment includes throw ropes of various lengths, 1 floatation ring, 1 bull horn, 4 cold water rescue suits. MR-498 was purchased by the Fire Department as a result of successful fundraisers including our annual letter campaign. Thank you for your support! Help Us Help You - Volunteer Today! 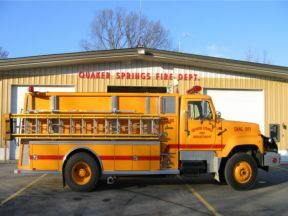 The Quaker Springs Fire Department can use your help. For more information call 518-584-3349. 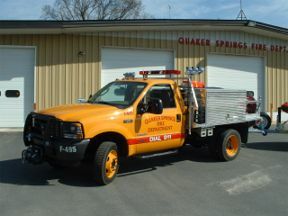 © 2019 Quaker Springs Fire Department. All Rights Reserved.